For most of the past decade, it has become impossible to watch a sporting event on television without being inundated with advertisements for testosterone replacement therapy (TRT) drugs. While the United States Food and Drug Administration (FDA) has only approved testosterone replacement therapy drugs to treat an extremely rare condition known as hypogonadism, drug companies have created a new market for their once seldom used product. The marketing divisions of several major drug companies have convinced aging men that by taking TRT drugs, it will help them overcome fatigue, mild depression, weight gain, loss of muscle tone, loss of libido and other characteristics of normal male aging. Drug companies claim these characteristics are really symptoms of having a low testosterone level or “Low-T”, as it is called by drug companies. They correctly figured men would be comfortable saying they are concerned about Low-T than they are about having low testosterone. To make matters more interesting, as our testosterone replacement therapy injury attorneys can explain, doctors and scientists do not know what a normal testosterone level should be or whether taking TRT drugs actually helps in any way. What is known by drug companies is that by taking TRT drugs, patients are exposing themselves to risk of serious medical conditions such as stroke and heart diseases. This, of course, has not slowed down drug companies in their marketing efforts or efforts to develop new kinds of TRT drugs. They are already available in a pill form (proven particulary dangerous), transdermal patches, sublingual (under tounge) films, injection, and others. 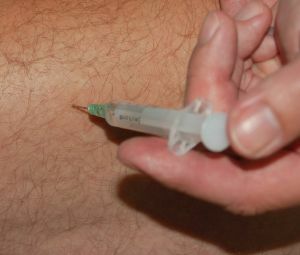 Now Antares Pharmaceutical is developing a subcutaneous TRT drug, which is getting attention from the FDA. This new drug is also designed to treat hypogonadism and has been shown in studies to cause patients to develop hives. According to a recent article from FierceBiotech, QuickShot, now in Phase II trials, caused one patient to break out in hives on his arm. Antares is arguing the condition was unrelated to QuickShot, but FDA officials are not in agreement with Antares. As a result of all the negative attention finally being given to TRT products, FDA is requiring more testing and wants to see additional safety data before approving QuickShot. The FDA is requiring Antares to submit safety data on 350 patients. This includes 200 patients who have been taking QuickShot for 180 days and 100 subjects who have taken it for at least one year. The company will have to conduct testing on at least 70 more patients to meet FDA requirement and is concerned this will delay approval and cost them money. This greater scrutiny during approval processes for new TRT drugs is in direct response to increased safety concerns involving elevated risk of heart attack and other adverse events, according to FDA officials. A panel of advisors from FDA has voted 14-1 to restrict TRT drugs to actual medical conditions such as hypogonadism. However, drug companies and their lobbyists have considerable influence on the approval process at FDA, and it is not certain there will be any change in allowing Low-T clinics to proscribe TRT to hundreds of thousands of men who do not have a medical need for the drug.